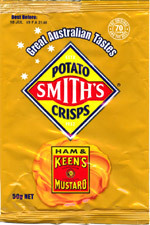 Taste test: Like the Bega Strong & Bitey flavor, in this new variety, Smith's is trying to capture distinct a Australian flavor. I delegated the tasting of these to my deputy as I am not a meat eater, and the idea of ham-flavored chips does not appeal (although I should note that no real meat goes into the preparation of these chips, so they are safe for vegetarians who still like meat). However, my deputy was not as impressed with these chips as he was with both the Bega flavour and the Heinz Big Red & Meat Pie flavour. These chips were very salty, and the mustard flavour did not work as well as was hoped. Fans of other ham-flavored chips should probably give these a go! Smell test: An unusual ham aroma.